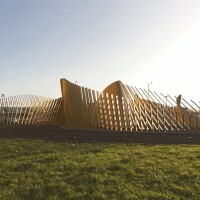 British architect Ian McChesney has designed the Blaze sculpture in Middlesbrough, England. Blaze has been designed to populate the disparate roadside verges of the A66 in Middlesbrough – this is the first phase of the piece which can be implemented at numerous locations along the roadside. The A66 currently passes through the centre of Middlesbrough and for many drivers it is their only viewpoint of the town. 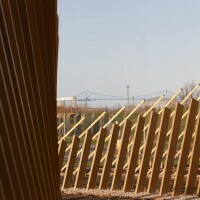 Blaze was conceived as a unifying treatment to the roadside which would gradually emerge along further stretches gradually providing Middlesbrough A66 with its own unique identity. 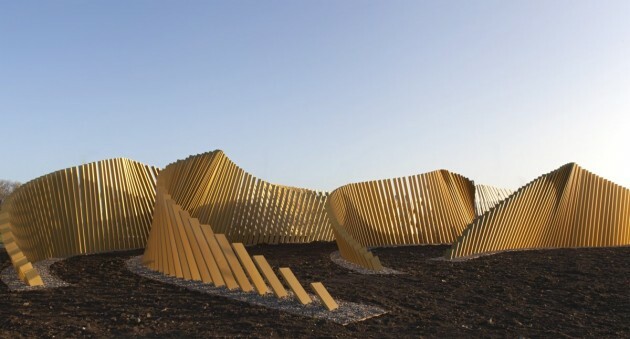 A series of anodised aluminium staves are set in the ground in long arrays which give the impression of giant forms in the landscape. 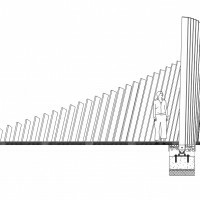 The arrays are arranged in layers so that the shape of the piece transforms as people pass by. 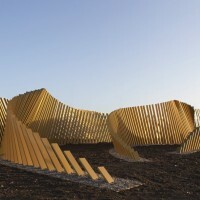 Fabricated in gold anodised aluminium Blaze is designed to catch the light in unusual ways creating a bright sculptural form along the often dreary dual carriageway landscape. 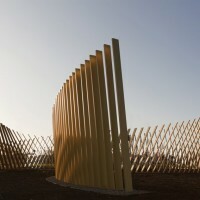 Blaze originated with a proposal to create a gateway feature at the Cargo Fleet Roundabout on the A66 in Middlesbrough. The adjacent authority, Redcar, had installed a series of roundabout sculptures with which this scheme was originally to have been aligned. 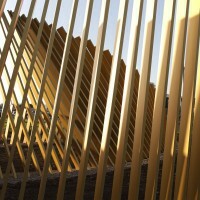 Middlesbrough Borough Council working in partnership with Tees Valley Arts, Arts Council North East, and advised by Christian Barnes, took the view that the project should be developed as a spatial design concept. It should consist of an integrated landscape approach that might be able to extend beyond the Cargo Fleet roundabout populating other parts of the A66 corridor. The Cargo Fleet roundabout would be just the first prototype of the scheme. A range of other sites have also been identified for the treatment including land adjacent to Trinity Crescent, the approach to Will Alsop’s Middlehaven development and the western approaches to the town. An RIBA competition was held in 2007 to find a designer of the scheme which was subsequently won by Ian McChesney who proposed Blaze. 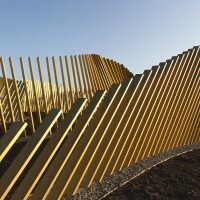 The piece was subsequently developed with engineers Atelier One and fabricator Chris Brammall Ltd.
• Blaze is approximately 35m long by 35m wide by 4m tall. • There are 472 individual staves of aluminium in Blaze. 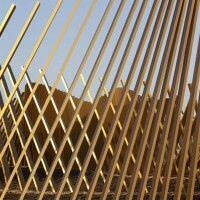 • There are a total of 165 linear meters of staves in Blaze. 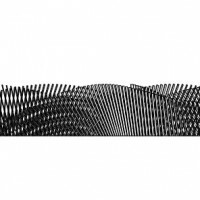 • The sculpture contains over 1.5 km of aluminium tubing. • The cost of Blaze was £116,000 to fabricate and install. • For the cost of Blaze we could build just 8 metres of motorway. You can watch a video of the sculpture – here.